Over the past few days Anthony Breznican over at Entertainment Weekly has released an astounding amount of news from Star Wars: The Last Jedi. His series of articles, which will all be featured in the next issue of Entertainment Weekly, have revealed countless details about the film. One such reveal has to do with the city of Canto Bight. We've been learning more and more recently about the city, which is said to be the home to an assortment of casinos and is located on the planet Cantonica. 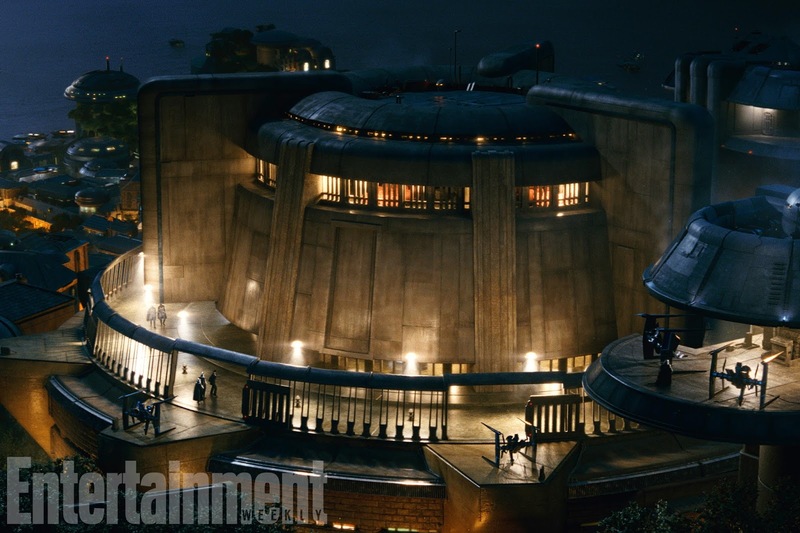 Included in EW's coverage was a new still from The Last Jedi(above) which shows a small portion of Canto Bight's cityscape. In the photo, near the bottom, you can see small speeders parked on various platforms. We now know these are the Canto Bight Police Speeders thanks to another recent toy leak. In the EW coverage we also learned the Finn and Rose will be journeying to Canto Bight on a mission to find the mysterious slicer "DJ". If and how the Police Speeder might play into the plot of The Last Jedi will be very intriguing to see. The film opens in theaters on December 15th!